Cupa Cabana is thrilled to provide exemplary add-on services for our clientele. We understand the perfect #cupaexperience is one that electrifies the senses: visually, tastefully and personally for each and every individual. Let us set the mood with personal, customized touches that will provide guests with a deliciously one-of-a-kind espresso experience. 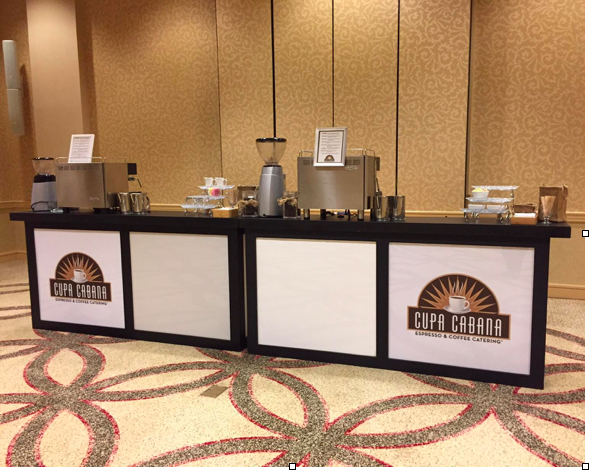 Our custom espresso bars add a special ambiance to any event, providing a small coffee oasis for your guests. We’ve sourced materials from local businesses to hand-build these espresso bars, and put great detail into creating a specialized space to serve delicious espresso and coffee creations to guests. Chances are we have the perfect espresso bar for your event’s look or theme – contact us for more information! Whether it’s the bride and groom’s favorite coffee indulgence, a themed evening, or a special launch – Cupa Cabana is ready to create a beverage menu specific to you! We love adding a personal twist to our offering, and welcome working with our clients on personalized, specialty Menus for their event. Our team will work together to ensure guests are welcomed with specialty beverages that will not only delight the tastebuds, but also welcome your attendees with a creative, personal feel specific to your event! Some of the best marketing is done silently, unbeknownst to your guests or attendees. One of our signature add-on services, specialty branding has helped numerous clients get their name circulating at trade shows, meetings, and other corporate events. Your brand on a cup of our delicious espresso or coffee is a talking point to move traffic towards your booth or table – and creating the cafe experience within your area welcomes new people to learn about your business. Consider adding your branding to our supplies and setup to tie the #cupaexperience directly into your brand!